Marvel Titan Hero Series 3-Pack Just $14.98! Down From $25! 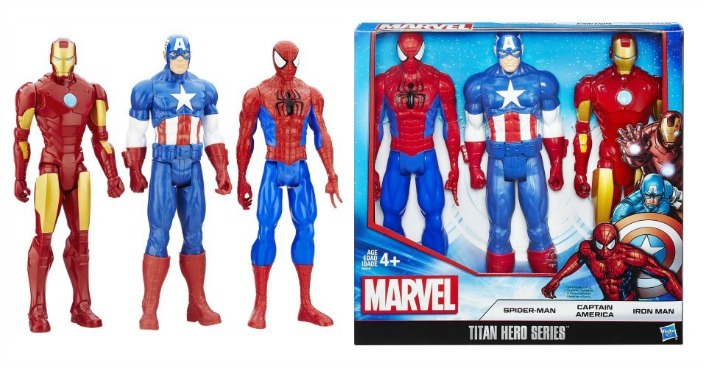 You are here: Home / Great Deals / Marvel Titan Hero Series 3-Pack Just $14.98! Down From $25! Right now you can get this Marvel Titan Hero Series 3-Pack for just $14.98 (Reg. $25) at Walmart! When the forces of evil strike, Capta and Iron Man blast into action, and Spider-Man swings his way into the center of the battle in this Marvel Titan Hero Series, 3-Pack. They aren’t just super looking; they’re also fun to play with. They have five-point articulation so boys and girls can pose their arms, legs and heads. Enter the battle with this pack of Marvel super hero figures, including beloved characters from the comic books and movies. With this trio’s vivid colors, detailed facial expressions and intricately designed bodies, children can imagine sending their favorites into battle. Each of these kids action figures come in a 12″ scale, and the package also includes one accessory.